The richness of Tibetan culture stems from the dedication and spiritual faithfulness of it's people. The depth of Tibetan traditions is rooted by thousand of years of cultural commitment to their system of belief. This astounding heritage, so easily discarded among other tribes and peoples around the world, has not been forsaken by convenience, political pressure or personal gain. The wisdom of the ages begins in Tibet, where for centuries earnest monks and lamas studied the mind, many meditating in the solitude of rock caves with no human contact for years. What they learned about the workings of the mind, the spirit and existence endowed them with the gift of compassion and love for all sentient beings. This tolerance of others, peace of heart, and ingrained compassion shows in Tibetan faces. Their simplicity of life is a choice. Their focus is not on obtain and possess, but rather living with joy and doing the right thing. This alpine region offers many surprises and thrills, but what makes Tibet such a choice and life changing experience are it's people. 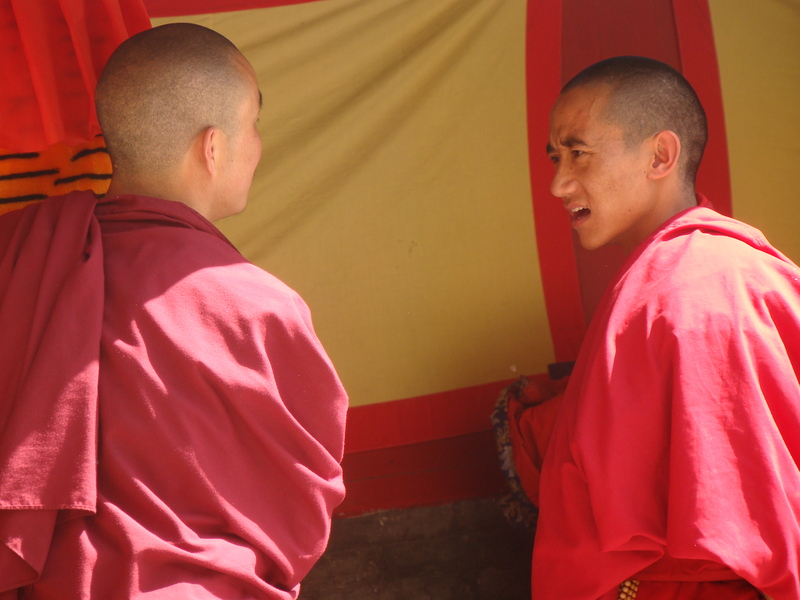 Let's examine the habits, rituals and customs that make the Tibetan culture so fascinating. Whenever you are greeted by Tibetans in their homes or when they know they are going to meet you for the first time, they will present you with a hada, placing it around your neck as they welcome you. Hada is a long (between 1/2 to 4 meters) piece of loosely weaved silk, usually white, some plain others with patterns. White signifies purity and good luck. In Lhasa, many street stalls sell hadas of varies quality and colors. The most special hada is five colors and is thought of as the clothing of Buddha so it can only be presented at very special occasions or to the Buddha in worship. They also present hada when worshipping at the temple or monastery, placing it around or near Buddha statues or other important manifestations before worshipping. They often leave a hada scarf when leaving, either on their seat or elsewhere to show that although they are gone, their heart remains. Tibetan even send mini hada scarves in letters of correspondence to send good wishes. Tibetans usually carry several hadas with them when they go out just in case they meet some friends or relatives. Presented during the New Year or other festival, presenting hada is a wish for a good year or happy holiday and a happy life. At a wedding, the meaning is a little different. It becomes a wish for eternal love and happiness. It also is a wish for Buddha blessings for the receiver. At funerals, people give hada to express condolences and comfort. One thing to remember for a funeral, never say Tashi Delek, which means "long life". Although Tashi Delek is a very common greeting in Tibet, it's in bad taste customarily at a funeral. Hada is also used to say farewell to guests. In presenting it to others it is a way to show respect, faithfulness, loyalty and love. Whenever a hada is presented, it should be received with both hands. During the last day of a year by the Tibetan calendar, monasteries hold a meeting of dharma (religious doctrine). Many lamas (a monk who has meditated in a cave in solitude for many years in order to understand the mind and to use the energy) wear colorful ancient costumes and masks, disguising themselves as ghosts. In groups they come out to the square center usually in the monastery) and dance to the accompaniment of drums, conch and cymbals. While they dance, they cry out with strange sounds in the hope of driving ghosts away. This is a time for long and serious prayer. During the ritual people often pray for happiness, health and world peace. According to Tibetan tradition, especially in the Lhasa Tibetan areas, people who do this ritual at home will hold it after supper. The ritual originates from the totem worship in ancient time. It is called “Guduo” in Tibetan language. On this day, people prepare a special feast called “Gutu”. For the meal people usually eat congee of barley or soup of Zanba. The special dinner “Gutu” consists of nine foodstuffs, barley flakes, peas, dough ball soup, radish and butter tea. To add to the festivity of the scene, people select some symbolic things and stuff them into the wheat paste balls. The stuffed paste balls and the dough balls are cooked together in a pottery pot and made into a delicious soup. Before they eat Gutu soup, everybody rubs some parts of his body with a wet paste ball uttering symbolic words such as, “Ah, the sufferings, pains and diseases all go away from me.” Then they drop the paste ball into the pot. When the balls are all cooked, the hostess will distribute the soup for everyone with a cooking spoon. You can imagine the fun! When someone discovers the symbolized food which looks like the sun, the moon, books or statues in their bowls, others will stop eating and raise the cups for his good luck and happiness. When someone has the paste balls stuffed with sheep hair, stone or dairy products in their bowls, people will say he should be as gentle as the sheep hair, as strong-willed as the stone and as pure as milk. When someone has the paste balls stuffed with salt, pepper, porcelain piece or charcoal, people will say that he should not be lazy, should not be unforgiving and should not be cruel, and request him to sing a song as punishment. Herein lies the most enjoyment, listening to song while enjoying this interesting soup. When a young girl has the paste ball stuffed with something resembling a naughty kid, people will laugh loudly and advise her to keep purity. If someone is not lucky enough to have the paste ball stuffed with a thorny fruit called Simare, other people will tell him to get along with people well and he has to drink wine and imitate the dog barking as punishment. Imagine! Barking at the table while everyone laughs! In the end, people will pour the leftovers of the Gutu soup into the broken cooking pot, and wish it to carry the bad luck away by saying: “take all the bad luck away and never return. In this way, the extraordinary ghost supper comes to end. In Tibet, when visiting relatives, the visitor usually carries a basket on his/her back, filled with gifts. Baskets are covered with a cloth, so no one can see what’s inside. In addition, the visitor always takes a thermos flask of buttered tea and a plastic bucket of barley beer. These two are indispensable. When a guest arrives, the host and hostess are very pleased. Their first words will be “ah, you’re welcome here.” Then they will begin to talk to each other on some easy topics, while drinking the tea and barley beer that the guest brought. After two or three hours’ chat, the guest will ask the host to accept the gifts in the basket. The host won’t take all the gifts, but will leave something like food or eggs in the basket, for the guest to take back. (Taking all the gifts would spoil a person’s good name). What’s more, the host will put something in the basket in return, some inexpensive things like fresh cabbage, fresh fruits or clothes for the children. The host will remember what’s been received, so that gifts of the similar value can be taken on a return visit some days later. Before the occupation of Tibet, every family sent at least one son to the monastery to become a monk. Not only was this a great honor, it kept families and the clergy connected in a real sense. Monks were needed for many facets of life and most especially for the passing of the dead. Monks and monasteries were supported by the people, not because they were forced, but because the system worked for them given their belief system. In those days, life was simply, but days were happily lived and no one starved in their communities. As a part of their worship, Tibetan Buddhists do prostrations. A prostration is performed with your hands first over your head in the prayer position. You touch you hands to your forehead, take a step forward as you lower your hands in front of your face, then take another step, then lower your hands to your chest, separate your hands, then bend down on you knees, place hands on the ground, and lower your body to the ground for a full prostration, touching the ground with your forehead. Stand up again and repeat. On the roads to Lhasa, from time to time you will see Tibetan Buddhists prostrating. From their homes all over Tibet, pilgrim walk to Lhasa, prostrating every three steps the entire route. They often wear a protective leather garment on the upper body along with some sort of protection for their hands, like a rock tied on, or a piece of wood tied on each hand. Along with kneepads, they carry Tsampa (roasted barley with yak butter) for sustenance. Usually their faces are covered with dust as they slowly amble toward their "mecca" with solid determination, praying the entire way. For many, this process to get to the holy city of Lhasa may take months or years. You can see both groups and single people along the roads. It's truly a sight to behold. With few provisions, these dedicated pilgrims often must ask for assistance of food or water along the way. Pilgrims also prostrate at monasteries, in front of the Jokhang temple in Lhasa, in front of the Potala Palace and during koras around holy sites, such at Mt. Kailash or mani stone sites. Tibetan pilgrims believe it is important to walk around (clockwise ONLY) sacred and holy sites and buildings. For instance, in Lhasa there are multiple koras; several around the Potala Palace, plus the Barkor (traces the outskirts of the Jokhang temple), Lingkhor (Encompasses entirety of the Tibetan old city, passing painting and temples en route), Nangkhor (encircles inner precincts of the Jokhang Temple). As they walk, they finger their prayer beads, each bead and chant representing some form of the prayer "O mani peni hum" meaning, "may all sentient beings have happiness and avoid suffering". The most visible form of Tibetan religion, besides the pilgrims prostrating themselves, is the their lovely art. Whether it is on the walls of monasteries or painted on what they call Thangka paintings, Tibetan art is extremely details and colorful. In fact, everything about Tibetan life is colorful, from their many varied costumes to the walls of their homes, to their religious buildings, color, bright color is seen everywhere. Their inspiration is found in their deep faith in Tibetan Buddhism and, less, the Bon Religion. Aside from current difficulties, they are a happy people, always smiling, always believing life will be better, if not this one, certainly the next. This deep seeded hope can be found in their beautiful art. Even look at the hills along the roads, rocks behind monasteries, Tibetans paint, in vivid color their gods, their beloved saints, and Buddhas. Many such wall paintings have survived from prehistoric times. Tibetans are a people who will not allow their faith to be shaken or bruised or killed. And as long as they exist as a culture, they will continue to believe, hope, improve themselves and pray for the peace and happiness of all sentient beings in the world. To witness this faith in action or in a painting is to gain something eternal, mystical, other-worldly. Visit this place before it fades into rewritten history. Although quite normal in Tibetan and Chinese lands, the following behaviors can be an adjustment for the proper westerner. It's probably better to be prepared so you can avoid the look of shock and abhorrence on your face when you cross one of these strange-to-us behaviors. Unless you are staying at a Hilton, the Chinese/Tibetan second or third class hotels usually don't have shower curtains. Yes, the water goes all over the bathroom and it is tile. Yes, you slip and slide unless you use a towel on the floor. Try rolling up a couple hand towels to block the water from going everywhere. Also toilet paper in China is akin to rice paper or very thin paper towels = rough. Hotels give you a tiny roll good for about a day. The reason is the same as why there is no toilet paper provided in public establishments. Like in Mexico, it disappears. BRING YOUR OWN TOILET PAPER EVERYWHERE. Beds! Humm, there should be a name for the thing called a bed in most hotels and hostels, other than 5 star, of course. It's a sheet of plywood with a thin matt on top, then covered with a lovely white comforter. This is when your sleeping bag comes in handy, for padding! Hot water is like gold. If you find any, feel rich. Also, you will here yelling in the hall on a regular basis. Something like "Quia, Quia!" Whenever you want something from the maid, simply go outside your door and begin yelling Quia! Quia!. A maid will appear and assist you. Here's how you get electricity to work in your hotel room. Use the key card in the slot by the door. Whenever you leave the room and take the key card the electricity will stop working. So if you want to charge batteries, be sure to leave something in that slot or your charging won't happen! Heating units are only operational in most rural area hotels from October-March. If it is cold any other month, you're plum out of luck. Bring a light down jacket - this will save you. Also, fill empty water bottles with hot water and tuck between the sheets. This is a life saver. Customarily Tibetans burn incense in the mornings to ward off evil spirits and "clean" the air. In an enclosed compound or hotel lobby there is twenty minutes or so of pure smoke so let it fade before smoke inhalation gets to you. At least the air is clean????????? Finding a western toilet may be the highlight of your journey. In Tibetan areas your options include stepping around the corner of a building, hiding behind a rock or bush, or finding a "bathroom" which is a big or little PUBLIC, emphasis on the PUBLIC, wooden shed with a few oblong holes to squat over. A neck scarf could provide something to cover your nose and mouth with, otherwise you may think you have the flu:) Seriously, it is bad. BRING TOILET PAPER! Don't be surprised to seeing men doing their thing anywhere, even busloads of them doing it together alongside the road! Happy, chatting, no mind! Men spit on the street, on the sidewalk, even in the restaurant. Hacking this spit up may kill your appetite, and you might not get used to it, but its part of the adventure. Smoking is done everywhere, inside, outside, in cars, taxis, etc. Speak up and politely ask a taxi driver not to smoke, that is if you can speak Chinese, because they don't usually speak Tibetan or English. Very odd to foreigners, but Tibetan men leave one fingernail long for convenience. No, they are not gay. This is a practical way to have a picking tool when needed for something. In smaller or remote Tibetan towns be aware that frying is often done on coal stoves in old sour fat. When chilies are fried in these woks, it can cause a choking or coughing fit. If you feel a tickle in your throat, a sudden cough, or notice a repulsive smell, simply don't eat there. Apologize, but go find a place you can eat in comfort. Be sure you take good wholesome food bars in the case these foods don't agree with you. It's a big risk to buy food off the street. There are no food hygiene regulations enforced. EAT AT YOUR OWN RISK. Bring Imodium and antibiotics, such as docycycline. No matter how careful you are, you are likely to get a touch of something if your wondering around Tibet or China. Bread items are wrapped in newspaper when you buy them. Wash fruits and vegetables as they are likely coated with fumes, pollution, etc. BTW, bland Tibetan bread is a good way to fill the stomach. Hot water is served everywhere. A few places offer tea bags or tea. You can buy butter tea or sweet tea. It is advisable to bring your own tea bags. Pollution is a huge problem in Chinese cities. Bring an inhaler and dusk mask. Many local people wear them to prevent the dust and smog from coating their lungs. Plan to spend most of your time in the rural areas where the air is clean and the beauty astounding. Shorts, bare arms and exposed cleavage is shocking to Tibetans. Please dress appropriately. Remember not to step on threshold when entering a monastery, tent or house. Fold hands as in prayer and bow to show respect to monks or lamas. When presented with butter tea or alcohol it is customary to drink 3 cups, if you only drink one cup it is considered an insult. If you drink 3 cups you are consider a friend. Add "la" behind the name to express respect when addressing a Tibetan person. If you are asked to sit down on the floor, cross your legs, do not stretch your legs forward and face your sole to others. Accept things like tea and gifts with both hands. While presenting a gift you should bend your body forward and hold the gift higher than your head with both hands. While offering tea, wine or cigarette, you should offer them with both hands. DO NOT touch the inside of the bowl. Do not touch, walk over or sit on any religious texts, objects or prayer flags in monasteries. Avoid touching ancient things to help preservation efforts. When the host presents you a cup of wine, you should dip your ring finger in the wine and flick the wine into the sky, in the air and to the ground respectively to express your respects to the heaven, the earth and the ancestors before sipping the wine. The host will fill the cup, and you take a sip of the wine again. After the host fills your cup again, you have to bottom it up. Tibetan people do not eat horse, dog and donkey meat and also do not eat fish in some areas, so please respect their diet habits. Tibetan people stretch out their tongue to greet you (usually only older people these days). It can be a sign of honor or it can have an opposite meaning, depending on the hand placement. They will also honor you by holding their hands in front of their chest with the palms toward you. It is nice to greet them with their own way if you can. Do not smoke in monasteries. Please walk clockwise in monasteries, Mani stone piles and kora routes. Walking counter-clockwise is degrading their religion. (not in the Bon temples). All animals and insects should be respected. Please do not kill anything as this hurts the heart of the loving Tibetans, who do not kill animals or insects, except the few yak that are eaten (done only by local butcher) Tibetans believe insects and animals may be relatives in past lives. Please honor their belief system. Eagles are the sacred birds in the eyes of the Tibetan people. You should not drive them away or injure them. On the outskirts, you could not drive or disturb the sheep or cows by wearing red, green or yellow clothing . ANYWHERE YOU WANT TO GO - WE TAKE YOU! DISCLAIMER: The data on this website is the collaborative experience by both travel professionals and non-professionals, contributions, and research of various websites, books, documents, research, articles, associates, attorneys, etc. The information on this site may or may not be accurate or up to date. The primary purpose of this site is education and service. We do not advocate any specific course of action, but offer ideas to think about. What you do with this information and any course of action you decide to take, if any, is entirely your responsibility. We wish you happy travels.